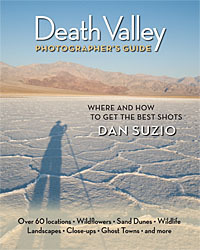 Photographer and writer Dan Suzio has been honored by the Outdoor Writers Association of California (OWAC) in the 2012 Excellence in Craft Competition for his book, Death Valley Photographer's Guide: Where and how to get the best shots. Suzio's book was selected as the best travel guide of 2011, and he was named 2012 Writer of the Year, the highest award in the competition. The awards were announced at OWAC's annual conference in Morro Bay, California. This is the second major award for Death Valley Photographer's Guide. 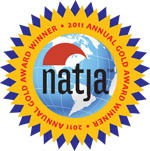 The book recently won the Gold Award for best photo travel guide of 2011 from the North American Travel Journalists Associtaion. Suzio, who lives in Berkeley, California, has been shooting in Death Valley National Park for more than three decades, and for almost that long his friends and colleagues have been asking his advice whenever they plan to visit the desert wilderness. He has compiled the best of that advice into a compreshensive guidebook. With a friendly tone and a sense of humor, Suzio describes how he photographs the landscapes, flowers, wildlife, and ghost towns of what is perhaps America's most storied national park, addressing both the technical and creative aspects of nature photography. The book is generously illustrated with the author's photographs, each one captioned with camera, lens, exposure, and other information about how it was made. The biggest section of the book provides descriptions of more than sixty specific locations in and around the park, noting the photographic highlights of each one, the time of day to find the best light, and the typical wildflower season - plus maps and directions to get you there. The book can be ordered online at www.DeathValleyPhotographersGuide.com or from retailers including Amazon.com and Barnes & Noble . 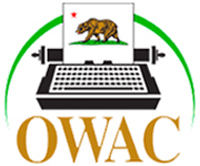 OWAC is a non-profit association of media professionals who cover outdoor recreational opportunities and related issues in California and the West. The membership includes newspaper and magazine staffers, freelance writers, book authors, radio broadcasters, video producers, editors, photographers, artists, lecturers and information officers. For more information, see www.owac.org.